High performance liquid chromatography-electrospray tandem mass spectrometry was used to elucidate the phospholipids in krill oil extracted from Euphausia superba, an emerging source for human nutritional supplements. The study was carried out in order to map the species of the choline-containing phospholipid classes: phosphatidylcholine and lyso-phosphatidylcholine. In addition, the prevalent phosphatidylcholine class was quantified and the results compared with prior analysis. The qualification was performed with separation on a reverse phase chromatography column, while the quantification was obtained with class separation on a normal phase chromatography column. An Orbitrap system was used for the detection, and pulsed-Q dissociation fragmentation was utilized for the identification of the species. An asymmetrical exclusion list was applied for detection of phospholipid species of lower concentration, significantly improving the number of species observed. A total of 69 choline-containing phospholipids were detected, whereof 60 phosphatidylcholine substances, among others seven with probable omega-3 fatty acids in both sn-1 and sn-2. The phosphatidylcholine concentration was estimated to be 34 ± 5 g/100 g oil (n = 5). These results confirm the complexity of the phospholipid composition of krill oil, and the presence of long chained, heavily unsaturated fatty acids. Krill oil has emerged as an important source of omega-3 fatty acids for human consumption during the last decade, and the amount sold on the world market is rapidly increasing. In contrast to traditional omega-3 supplements on today’s market, which are based on omega-3 fatty acids bound to triglycerides (such as cod liver oil and fish oil) or bound as ethyl esters (Omacor/Lovaza), krill oil contains a high proportion of omega-3 fatty acids bound to phospholipids. Krill oil has been investigated in several preclinical and clinical studies [1, 2, 3, 4], and there is growing evidence that the molecular form of the omega-3 fatty acids (i.e. triglycerides, ethyl-esters, phospholipids) might be of importance for their biological effect as well as distribution of the omega-3 fatty acids in the body. In one animal study, it was demonstrated that when krill oil and fish oil were administrated to Zucker rats with an equimolar dose eicosapentaenoic acid (EPA) + docosahexaenoic acid (DHA), krill oil had stronger and in some instances different effects than fish oil on specific parameters related to the metabolic syndrome . The lipid level in both heart and liver was significantly lower in rats treated with krill oil, when compared to rats fed the fish oil diet. The authors suggest that this difference may be linked to differences in the incorporation of omega-3 fatty acids into membranes, and consequently a reduction of inflammatory molecules and endocannabinoids, which might be relevant for the differences observed between fish oil and krill oil. Further, in the same study, it was demonstrated that the level of DHA in the brain increased significantly after krill oil administration, but not after fish oil administration, when compared to control animals . Thus, omega-3 fatty acids linked to phospholipids may be differently distributed in the body compared to omega-3 fatty acids in other molecular forms. Moreover, in a clinical safety study, the presence of EPA and DHA in the blood plasma was determined after daily administration of 2 g krill oil or 2 g menhaden oil for 4 weeks . The authors concluded that EPA and DHA from krill oil are absorbed at least as well as that from menhaden oil. The aim of the current study was to characterize the phospholipids in krill oil in more detail to evaluate the composition of the fatty acids present in the phospholipids. The composition was determined using LC/ESI–MS(/MS), a technique which has lately played an important role in characterization of the lipidome in tissues and organisms . An inherent limitation in the use of ESI for the ionization of long chained fatty acids has been described by Koivusalo et al. . The study showed that the instrument response is affected by the acyl chain length. This is a consideration which is important particularly in the quantification of the lipids. The elucidation of the phospholipid species is often performed either by doing a precursor ion scan or a neutral loss scan with triple quadrupole instrumentation [7, 8, 9], or with MSn fragmentation with systems based on ion traps [10, 11, 12, 13]. Normal phase liquid chromatography (NPLC) and reverse phase liquid chromatography (RPLC) are both frequently used for the separation of the components [10, 14, 15, 16, 17]. Of these two separation techniques, RPLC has been shown to be more suitable for species separation and characterization . Different ionization and fragmentation techniques can be used for the evaluation of phospholipids. Ionization of the phospholipids may be performed in negative- and positive-ionization mode. In general, fragmentation of phospholipids in the positive mode provides information about the phospholipid head group, while fragmentation in the negative mode is the source of structural information. For phospholipids containing choline-headgroups, the choline-specific fragment m/z 184 has been used in precursor ion scanning operating in the positive ionization mode for class determination [7, 18]. Also in the negative mode, class-specific fragments may be used in the characterization. All phospholipid classes, except those containing choline, yield molecular ions [M−H]− when a formate-based mobile phase is used. On the other hand, the choline-containing classes form stable adducts with formic acid in the mobile phase, yielding [M + FA−H]− ions (m/z = M + 45) [19, 20]. With fragmentation, this adduct dissociates with the loss of (HCOO + CH3) into the fragment ion [M−CH3]−. This is in particularly useful in methods utilizing RPLC for separation. Although the chromatographic class information is lost in such setups, the class-specific fragments may be used in the characterization of the species . Two ion activation techniques may be used for MS analysis utilizing ion traps: collision-induced dissociation (CID) and pulsed-Q dissociation (PQD) techniques. While CID has a low mass cut off below 28% of the m/z for the precursor ion, the novel PQD technique eliminates the potential loss of low mass fragments [21, 22]. This difference could be crucial in the fragmentation of larger molecules into low mass, specific fragments, as shown with detection of iTRAQ fragments with a linear ion trap . 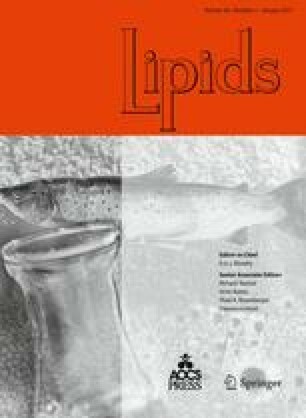 The fatty acid composition of phosphatidylcholine (PtdCho) from krill oil has previously been investigated by Le Grandois et al. . This study was performed with a method based on the ESI operated in the positive mode with triple quadrupole detection of lithium adduct ions, and showed the presence of a higher number of PtdCho species with long chained unsaturated fatty acids, than seen in egg yolk, ox liver and soy. We believe the current study verifies previously presented findings and offer new insights into the composition of krill oil. In addition; it shows the advantage of performing an additional fragmentation using an exclusion list in the identification of low prevalent species. Phospholipid standards of lyso-phosphatidylcholine (lyso-PtdCho), PtdCho, phosphatidylethanolamine (PtdEtn), phosphatidylinositol (PtdIns) and phosphatidylserine (PtdSer) were purchased from Sigma-Aldrich (St. Louis, MO, USA). Lyso-PtdCho, PtdCho and PtdEtn were lyophilized powders obtained from egg yolk, whereas the PtdIns source was glycine max and the PtdSer source was bovine brain. EPAX 6000 TG® fish oil was donated by EPAX (Ålesund, Norway), and Superba™ krill oil was obtained from Aker BioMarine (Oslo, Norway). All other chemicals were of MS grade. The chromatography was carried out on a Dionex system consisting of an Ultimate 3000 pump, an Ultimate 3000 RS autosampler, and an Ultimate 3000 flow manager. Detection was obtained using a linear ion trap LTQ XL coupled to an Orbitrap Discovery, LC-operation, data acquisition and processing were carried out using Chromelion SDK 6.80 SP2 Build 2327 and Xcalibur version 2.0.7 coupled with DCMSLink 2.5 (all Instrument-Teknikk AS, Østerås, Norway). The LTQ Orbitrap system was operated with a spray voltage of 5.00 kV, nitrogen as the sheath gas with flow rate set to 30 arbitrary units, and helium as the collision gas. The quantification of the PtdCho class was performed with a scan from m/z = 400 to m/z = 1,000 operated in negative ionization mode. MSn experiments for identification of the choline-containing phospholipids were performed using data dependent PQD for the first fragmentation step. The molecular ion selected for each fragmentation in this step, was the most intense ion detected by the Orbitrap analyzer with target mass resolution of 30,000 and a scan window from m/z = 400 to m/z = 1,000. The normalized collision energy was 200 and the isolation width 2.00 Da. Subsequently, the most intense fragment ion detected was further fragmented using CID, with the normalized collision energy at 35 and an isolation width of 2.00 Da (MS3). The LTQ was utilized for the detection of the fragments and the m/z range was relative to the m/z of the molecular ion. An alternative method was used in order to be able to observe species that were not selected for fragmentation in this way. The overall setup of this method was as described above, with the distinction of adding an asymmetric exclusion list. The exclusion list was generated with the purpose of the LTQ to ignore already identified substances. The list was based on the m/z of the molecular ions, with an exclusion window from this mass-to-charge ratio, up to m/z + 1. The width of the exclusion window was selected in order to diminish the detection of isotopes of the molecular ions. Chromatographic separation was performed on a ZORBAX Eclipse Plus C18 column with particle diameter of 5 μm and the column dimensions were 150 × 2.1 mm i.d. The mobile phase A consisted of 90 parts 1% TEA and 0.2% formic acid in water, and 10 parts mobile phase B (v/v). Mobile phase B consisted of 1% TEA and 0.2% formic acid in 60 parts methanol and 40 parts acetonitrile (v/v). A linear gradient was used for the separation. The system was first kept isocratic at 65% mobile phase B for 5 min after injection of sample. The gradient was then run from 65 to 100% mobile phase B in 5 min and was kept isocratic at 100% mobile phase B for 20 min, before it was returned to the initial condition in 0.1 min. The column was regenerated with 65% mobile phase B for 16 min. The mobile phase flow was set to 0.2 mL/min and the injection volume was 20 μL throughout the study. NPLC was performed on a HiCHROM LiChrospher 100 DIOL column with a particle diameter of 5 μm and column dimensions of 250 × 2 mm i.d. Mobile phase C was 100% chloroform, and the mobile phase D consisted of 0.05% TEA, 0.05% ammonia and 0.1% formic acid in methanol (v/v). For the class separation of the phospholipids, a linear gradient was used. The gradient was run from 5 to 27.5% mobile phase D in 15 min, followed by a rise to 80% in 2 min to flush the column. This concentration was kept isocratic for 4 min, before it was returned to the initial condition in 2 min. The column was regenerated with 5% mobile phase D for 12 min. The mobile phase flow was set to 0.3 mL/min, and the injection volume was 20 μL throughout the study. Samples of krill oil and stock solutions of standards were prepared by dissolving the lipids in a mixture of chloroform and methanol at a ratio of 2:1. These solutions were stored at −32°C and excessive heating cycles were avoided. Samples were prepared by further dilution with solvents compatible with the mobile phases used. For NPLC, this was achieved with chloroform:MeOH 95:5, while it was attained by dilution in mobile phase A for RPLC. For the quantification, a calibration curve was established with samples of PL free fish oil (EPAX®) spiked with a PtdCho standard purified from egg yolk to concentrations of 100 μg/mL. The spiking of PL free fish oil was performed in order to produce comparable matrixes in the standards and the krill oil samples. Stock solutions were made by dissolving PtdCho standard, PL free fish oil and krill oil separately in mixtures of chloroform:MeOH 2:1. The concentration of krill oil and PtdCho standard was 1 mg/mL and for PL free fish oil 10 mg/mL for these solutions. Respectively, 100 μL of PtdCho standards and of krill oil was added to 900 μL of the PL free fish oil, producing samples with concentrations of 100 μg/mL. For the calibration curve, the PtdCho standard samples were consecutively diluted to the desired concentrations of 10.0, 5.00, 2.50, 1.00, 0.50, 0.25, and 0.10 μg/mL (n = 5) with a mixture of chloroform:MeOH 95:5. The krill oil samples were diluted in the same way to a concentration of 1.00 μg/mL in order to measure the PtdCho content within the linear area of response of the calibration curve. Initial experiments with standards of PtdEtn, PtdIns, PtdSer, PtdCho and lyso-PtdCho, were performed in both positive- and negative- ion mode using the LTQ Orbitrap as a detector. Separation of these substances on a NPLC column yielded class-specific baseline separation (data not shown). The results of these tests indicated a minor difference in the signal intensities obtained between the two settings, with a slightly higher response in negative mode. Since krill oil, as established in Fig. 1, is predominantly composed of choline-containing phospholipids, the emphasis of the work was focused on the elucidation of the species in the PtdCho and lyso-PtdCho classes. In NPLC, class separation of the phospholipids is achieved. A clear tendency of the elution order from the column was seen from high m/z to lower m/z. PtdCho class species eluted from 6.5 to 8 min, and the elution of the lyso-PtdCho class occurred between 10.5 and 12 min. Some species separation was seen within the PtdCho class, however, this was not adequate for identification of the diverse species within the classes. As the identification of the components is performed with data dependent fragmentation, chromatographic separations of the substances are critical for detection of the less prominent species. Hence, the separation for characterization of the species was performed utilizing a RPLC C18 column as described under “Experimental Procedures”. This improved the chromatographic performance for species separation compared to NPLC (Fig. 2). As lyso-PtdCho only carry one fatty acyl group, these components elute earlier in the chromatogram than the PtdCho species. Lyso-PtdCho dominate the region between 12.0 min and 14.5 min in the chromatogram, while the heavier PtdCho components dominate the chromatogram after 14.5 min. The identification of the species was performed utilizing a MS3 data dependent fragmentation method, with an initial PQD fragmentation resulting in the loss of methyl formate, followed by a CID fragmentation. Analysis of the fragmentation spectra obtained typically revealed the identity of the substances without ambiguity. However, co-elution of isobaric compounds could potentially complicate the interpretation of the spectra. This challenge is minimized by applying a set of criteria for reliable identification. The following criteria were applied for reliable interpretation of a choline-containing phospholipid: based on the mass-to-charge ratio of the molecular ion, it is likely to be a choline-containing phospholipid (i.e. m/z being an even number). Following the first CID with PQD, a daughter ion should be produced by the loss of (HCOO + CH3) as 60 Da. Further fragmentation with CID of the resulting product should produce specific fragments revealing the nature of the fatty acyl groups in both the sn-1 and the sn-2 position, either by the occurrence of the fragment for the fatty acyl group itself, or by the presence of the corresponding fragments of the lyso-compound. The sum of the fatty acyl groups elucidated in this matter should yield a mass matching the initial molecular mass. This is illustrated in Fig. 3, showing the elucidated fragment identity for the fragmentation of the 20:5–22:6 diacyl PtdCho. The spectra were generally dominated by fatty acyl fragments from both the sn-1 and the sn-2 positions in addition to their corresponding fragments of the lyso-compound, ensuring identification of the species. The lyso-PtdChoand PtdCho substances identified by applying this method are presented in Tables 1 and 2. The relative intensity of the molecular ions is also presented. As described earlier, the use of signal intensities in MS, for concentration comparison of the different substances, is only semi-quantitative. However, it provides a valuable indication of the composition of the PtdCho and lyso-PtdChoclasses. Chromatograms and fragmentation patterns are presented in Figs. 4 and 5 for the 10 foremost substances characterized from the PtdCho class. As data dependent fragmentation methods are, by nature, biased in the selection of the most prevalent substances, the experiments where repeated with the use of an asymmetric exclusion list added to the MS-method. The exclusion list was based on the data sets obtained with the initial settings (i.e. Tables 1, 2). This method allowed the detection and identification of the additional substances presented in Table 3. Krill oil predominantly contains phospholipids from the PtdCho class (Fig. 1). It was therefore attempted to quantify the absolute concentration of this class by use of class separation with NPLC. Quantification of the PtdCho class was performed with a method developed “in-house” with a LTQ Orbitrap mass spectrometer for the detection. In the construction of the calibration curve, PtdCho concentrations above 1.00 μg/mL resulted in a relative decrease in the MS signal response, yielding a quadratic polynomial curve (y = ax 2 + bx + c) where a = −9,766, b = 330,360 and c = 4763.8 with r 2 = 0.9995. From 0.10 μg/mL to 1.00 μg/mL, the calibration curve showed a high degree of linearity (r 2 = 0.9995) with a linear regression curve (y = bx + c) where b = 368,737 and c = −16,547. The latter area was chosen for quantification purpose. From this, the PtdCho content of the undiluted krill oil was determined to be 34 ± 5% (w/w) (n = 5). Comparisons of the mass spectrum of the sample with the spectrum of the PtdCho standard indicated a difference in PtdCho class composition (Fig. 6). From the results, the average acyl chain lengths appear to be higher in krill oil than in egg yolk. This has also previously been shown by others . As mentioned above, instrument response is affected by the acyl chain length of the PtdCho. These differences in chain lengths could therefore influence the quantification of the PtdCho class as discussed later. The quantitative results were compared with an earlier analysis of the krill oil, performed by the accredited analytical company Nofima (Bergen, Norway). They reported the PtdCho concentration in the krill oil sample to be 35 g/100 g oil. The fact that fatty acyl chain lengths of the PtdCho species are relatively long, affects both the choice of fragmentation technique and the effect of standards used for quantification purposes. Due to the low mass cut-off limit at 28% of the molecular ion mass with CID fragmentation in ion traps, fragmentation utilizing PQD in the positive ionization mode was chosen as the first fragmentation step. In addition, utilizing PQD in the first fragmentation step of a MS3 method, operating with negative mode ionization, also yields class elucidation of phospholipids with choline head groups. This is achieved by the detection of the [M−CH3]− fragment formed after (HCOO + CH3) loss from formate-molecular ion adducts. Consequently, performing a mode shift from the positive to the negative ionization mode is not necessary for the overall identification of lyso-PtdCho and PtdCho class phospholipids. PQD with a normalized collision energy at 200 produced the [M−CH3]− fragments, without extensive fragmentation to secondary fragment ions. Higher collision energies produced secondary fragments that could be used as a source of structural information; however, this was better achieved with CID as a second fragmentation step. The CID was operated with a normalized collision energy of 35, for further fragmentation of the [M−CH3]− ion. This value was not optimized for the individual species, and additional structural information could potentially have been achieved by specie specific optimization of this setting. With the described method for separation and fragmentation of the phospholipids, typical fragmentation patterns were obtained, as shown in Fig. 3. The spectra were dominated by fatty acyl fragment ions originating from both sn-1 and sn-2, except in the fragmentation of alkyl–acyl species, where only a single fatty acyl fragment ion was observed. In addition, the corresponding fragment ions of the lyso-PtdCho compound were prevalent, confirming the characterization of the species. The fragments associated with the lyso-PtdCho compounds were either in the form of [lyso-PtdCho–CH3]− or [lyso-PtdCho–CH3–H2O]−. Furthermore, fragments specific for phospholipids carrying a choline head group were often registered. These dissociation products were m/z 257, m/z 242 and m/z 223, representing [Glycero phospho choline]−, [Glycero phospho choline–CH3]− and [Glycero phospho choline–CH3–H2O]−, respectively. The identification of the phospholipid class was made based on the loss of 60 Da in the PQD fragmentation step. However, fragments specific for phospholipids carrying a choline head group affirms this interpretation. In spectra obtained from the dissociation of species carrying a 20:5 fatty acyl group, an ambiguous [20:5–H2O]− fragment ion with m/z 283 can often be detected. This ion can potentially be misinterpreted as the fatty acyl fragment [18:0]−, but meeting the criteria for reliable identification will rule out this erroneous conclusion. In some incidences, a molecular ion could be explained by either being a diacyl-, or an alkyl–acyl-compound. In these cases, the possible identification of alkyl–acyl PtdCho species was based on the presence of a relatively high MS-signal for a single fatty acyl fragment ion and the corresponding lyso-PtdCho compound. In addition, there should be a total absence of signals (i. e. both fatty acyl-, and lyso-PtdCho-ions) potentially explained by fragmentation of an ester bond in the opposite sn-position. An example of this is m/z 764.6 (spectrum shown in Fig. 5f) which could originate from both O16:0–20:5 alkyl–acyl PtdCho and 15:0–20:5 diacyl PtdCho. The presence m/z 466 [(lyso-PtdCho O16:0/15:0)–CH3]−, 448 [(lyso-PtdCho O16:0–15:0)–CH3–H2O]− and 301 [20:5]− indicate a fatty acyl group of 20:5, while there is no fragment indicating a fatty acyl group of 15:0 in the opposite sn-position. This is therefore assumed to be a PtdCho-specie with an alkyl-acyl composition of O16:0–20:5. Altogether, seven different potential alkyl-acyl PtdCho species were characterized. For all these species, the fatty alkyl chains were either hexadecanoic or octadecanoic, and either saturated or with a single double bond. No further attempt was made to clarify the stereospecificity of the species. It is important to keep in mind that stereoisomers would be difficult to separate and specifically identify. Therefore, the relative intensity values presented in Table 2 will in many cases be the sum of the signal intensities of the two stereoisomers. The ratio between the stereoisomers will vary among the different species. However, an interesting observation was that several of the n-3 acylated species appear to carry the n-3 fatty acyl group in the sn-1 position, based on the fragment ratios in the fragmentation spectra (e.g. 22:6–18:1 diacyl PtdCho). In total, 58 species were characterized without the use of the exclusion list, whereof seven were from the lyso-PtdCho class and 51 from the PtdCho class. An additional 11 species were detected by applying the asymmetric exclusion list. Of these latter, two were identified as lyso-PtdCho and nine as PtdCho compounds, yielding an overall total of nine lyso-PtdCho class species and 60 PtdCho class species elucidated. Seven species yielded signals for highly probable fatty acyl n-3 groups in both the sn-1 and sn-2 positions (i.e. the diacyl PtdCho species 18:4–20:5, 18:4–22:6, 20:5–20:5, 20:5–22:6, 20:5–23:5, 22:6–22:6 and 20:5–22:5). Those species and the detection of more exotic species such as 22:6–23:5 and 20:5–26:4 diacyl PtdCho, show the complexity of krill oil. Prior to analysis of the krill oil, the total fatty acid composition, wherein information on the concentration of individual fatty acids and their n-3 content was obtained and provided by Nofima, with the method AOCS Ce 1b-89 (data not shown). The sum of polyunsaturated (n-3) fatty acids was reported to be 18.5 g/100 g oil. The assumed homologous distribution of the fatty acid composition between triacylglycerols, free fatty acids, and the lyso-PtdCho- and PtdCho-classes, combined with the described relative intensities of the known species (Tables 1, 2), makes it possible to estimate the prevalence of n-3 fatty acids in one or both sn positions of the PtdCho species. For the PtdCho class, approximately 58% of the components contained a single n-3 fatty acid, and 10% held an n-3 fatty acid in both sn-1 and sn-2 positions. Of the species in the lyso-PtdCho class, approximately 35% contained an n-3 fatty acid. The phospholipid composition might potentially give better insight into the mechanism and distribution of krill oil in the body. In the analysis performed by Nofima, the PtdCho concentration of the same krill oil as was used in the current study was reported to be 35 g/100 g oil (Nofima internal method N A88, based on [25, 26]). With the method developed for this work, the PtdCho concentration was estimated to be 34 ± 5 g/100 g oil. This shows that, in spite of the difference between the methods, the correlation of the values obtained with the two methods is relatively high. Dissimilarity between the standards used for calibration and the actual composition of the phospholipid classes in the sample could influence the quantification. In this work, we utilized a PtdCho standard originating from egg yolk. The difference in the PtdCho profile between this standard and the krill oil (Fig. 6) could potentially result in an underestimation of the PtdCho content of the sample. This is a result of krill oil containing long chained fatty acids in the phospholipid components, which are less prone to ionization with ESI as described earlier. Hence, the use of a PtdCho standard originating from krill oil would have been preferred. However, this type of standard was not commercially available when the study was performed. Krill oil has been analyzed by a novel method and numerous molecular species were found that were previously not known to be present in krill oil. To our knowledge, there has previously only been one report showing the fatty acid composition in PtdCho from krill oil  The method used in that study was comparable to the platform used in the current study, however, their detection was based on the formation of lithium adducts, detected with a triple quadrupole. The krill oil used in that study was delivered by Nestec SA (Lausanne, Switzerland), and the composition of the two krill oils might therefore not be directly comparable in respect to composition. However, in both studies the following three PtdCho species were among the five most prevalent: (16:0–20:5) (16:0–22:6), and (16:0–18:1). On the other hand, they detected high levels of other PtdCho species that are low or absent in our study, such as: (18:1–20:5) and (18:0–18:2). Le Grandois et al. detected neither fatty acids longer than 22 carbons nor ether-linked fatty acids. Moreover, in our study, a higher number of PtdCho species was detected. Whether these differences are due to a different composition of the two krill oils, or the methodology is not known, but might indicate that the detection method used in the current study is more sensitive. The method used for quantification purposes in this study was optimized for specific quantification of the PtdCho class, and quantification of other PL classes was not attempted. However, it would be of great interests and an aid in the field of lipidomics, to develop standardized and validated LC–MS methods that meet the need for quantification of all phospholipid classes in complex matrixes like krill oil. One of the potential challenges in the development of such strategies would be the choice of suitable standards for the calibration curves. The authors would like to thank Dr. Inge Bruheim and Dr. Åsmund Larsen for their helpful input and valuable discussions during the method development. This work was partially funded by Aker BioMarine ASA.